Munster will encounter a brute physical force in Paris this afternoon but it will be the intense emotional challenges which may be just as difficult to overcome. For they will re-trace so many footsteps of grief as they return for the Champions Cup fixture against Ronan O'Gara's Racing 92 which was postponed due to the death of Anthony Foley last October. In the weeks and months since, the team led by the unifying force of Rassie Erasmus have been resolute in the face of such anguish, losing just once in 10 games. The lone defeat, in Leicester before Christmas, requires to them to win today to maintain their hopes of qualifying for the last eight for the first time in three seasons and they will probably need to win away to Glasgow next week also. However, events have taught this squad to confront every task as it arises and the particularly acute challenges presented today will demand a steely determination from a group who have manfully stood tall throughout a traumatic few months. "Emotionally, it's the week that we remember Axel passing away," notes Erasmus. "That will be a challenge for us. But we have had to go on with everything and that is what we will keep on doing. Erasmus has been forced to change his line-up for the first time in this competition, with injury and a gruelling three-week European run sharpening his thinking. Andrew Conway comes in on the right wing for the injured Darren Sweetnam while Ronan O'Mahony edges out Keith Earls on the other side, with Rory Scannell, also covering out-half as Ian Keatley is omitted entirely, partners Jaco Taute, preferred to Francis Saili in midfield. There are key changes in the pack, with Dave Kilcoyne supplanting James Cronin at loosehead. Although Tommy O'Donnell (above) wins his fitness race to feature in an unchanged back-row, second-row Jean Kleyn is missing, Dave Foley coming in to the bench. Racing 92, last season's finalists but already eliminated from this year's competition after losing all three games, have weakened their line-up but it remains an ultra-competitive string nonetheless, with Dan Carter on the bench. Former Munster centre Casey Laulala is included. 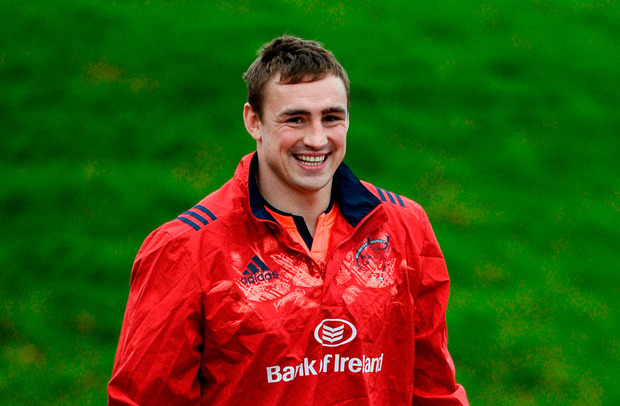 Scrum-half James Hart, a Munster target, is among the replacements. Racing 92 - J Imhoff; J Rokocoko, C Laulala, A Tuitavke, T Thomas; B Dambielle, X Chauveau; K Vartanov, C Chat, L Ducalcon, G Grobler, F van der Merwe, C Masoe capt, M Voisin, A Claassen. Reps: V Lacombe, J Brugnaut, C Gomes Sa, A Williams, S Fa'aso'o, J Hart, D Carter, H Chavancy. Munster - S Zebo; A Conway, J Taute, R Scannell, R O'Mahony; T Bleyendaal, C Murray; J Cronin, N Scannell, J Ryan; D Ryan, B Holland; P O'Mahony capt, T O'Donnell, CJ Stander. Reps: R Marshall, D Kilcoyne, S Archer, D Foley, J O'Donoghue, D Williams, K Earls, F Saili. Ref - Matthew Carley (RFU).